So I have previously hinted at some mods I managed to get done before the SSCT Track day at Fuji Speedway a few weeks ago. Well, here is one. 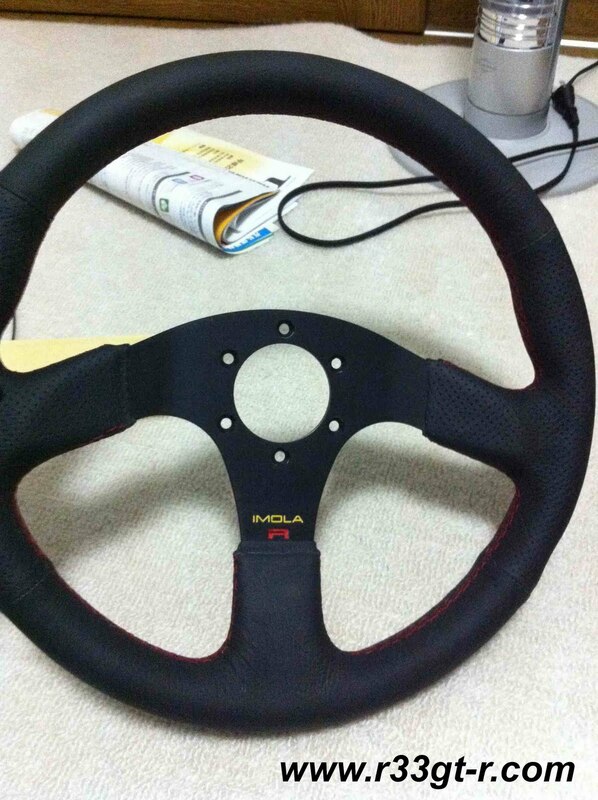 I went ahead and installed this: a rare Ital Volanti Imola R steering wheel that I found on Yahoo Auction for cheap, and had retrimmed by Robson Leather (link to my visit). By getting Robson to do the retrim, I was able to specify their "European stitch" in the brightest color red string they had. 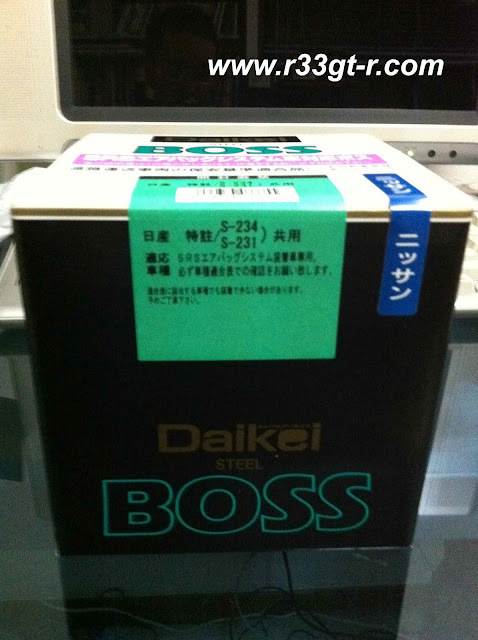 Finding the proper boss initially appeared to be another problem - most of them out there had cheap looking plastic accordion looking covers but I found this one by Daikei which has a nice "crinkle finish" cover. 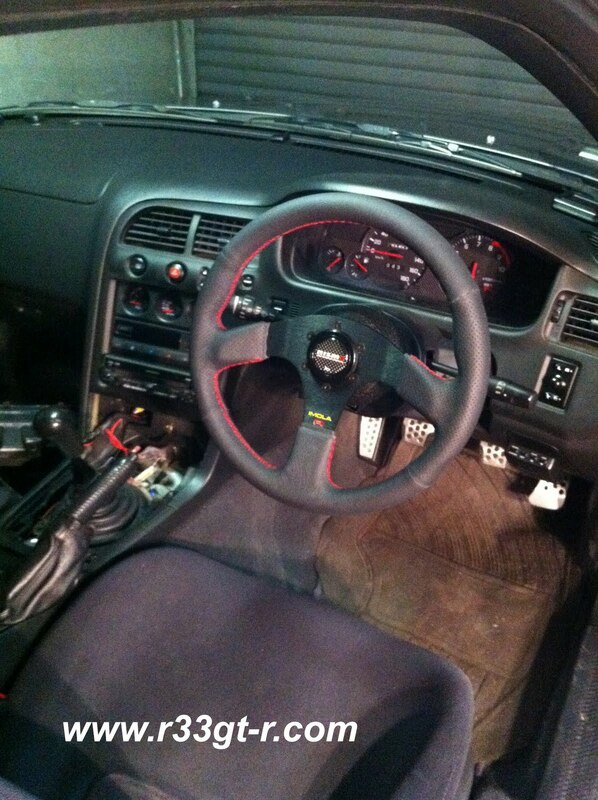 Step 1: On the bottom of the wheel and sides of the stock steering wheel, there are plastic covers. Remove with a flathead screwdriver. Turn the wheel to one side to access the bottom, and disconnect the airbag and horn leads. Step 2: On the left and right sides, you will see two screws (hexhead) on each side, remove those and the middle airbag section comes off (don't forget to unplug the battery first for at least one hour before starting...). Step 3: You now have this - the center bolt is what you need to remove, I THINK it was a 19mm socket I used. 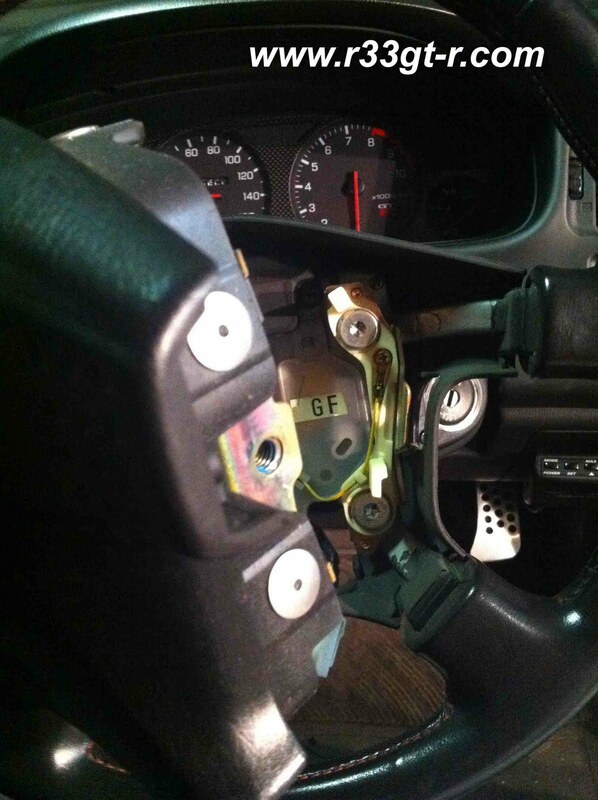 BUT, important tip here - use force to loosen, but not completely remove this bolt. This is because the wheel has to come off, and it takes some force, so having the bolt loose but not off prevents the wheel from ending up in your teeth. Note the two leads coming out, that is the airbag lead and the horn lead. 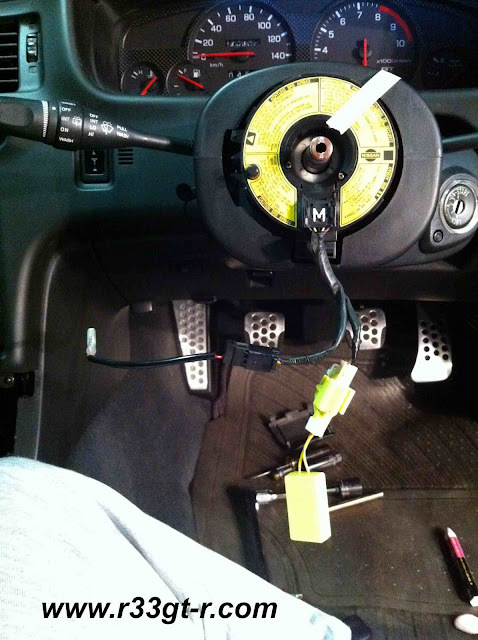 On the steering boss kit I got, it provided for a plug in resistor for the airbag, and a plug in lead for the horn (both attached here). Step 5 to end: After attaching those leads, making sure the wheels are straight forward (it helps to mark the spindle before completely removing the wheel - that's what the masking tape is for by the way - and you can also see the paint I applied), attach the boss following the instructions that come with the kit. The boss should slide onto the spindle, and there are some "guides" that stick out to ensure the boss is on straight. The wire leads are taped around the boss itself, and then the cover goes on. 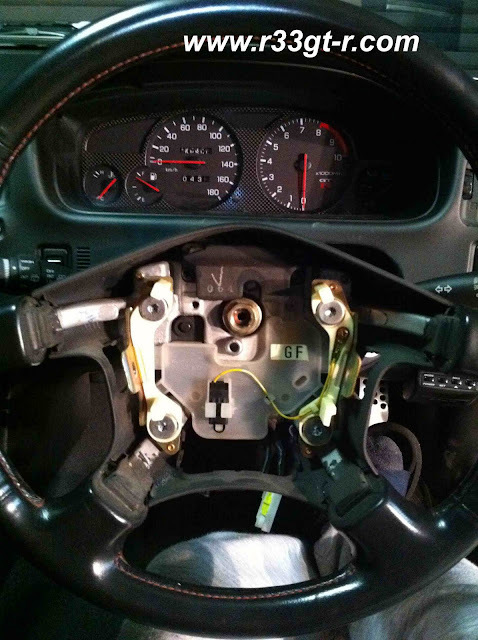 Then you choose which adaptor plate to use and attach your steering wheel with 6 small Allen head bolts, attach the horn button (I chose to use a Nismo one I found) and you are done! So what do people think? Like or dislike? As someone told me once "everyone has a Momo" so I wanted something different. Not a big fan of Alcantara, so leather was the choice. If I had to critique, I'd say the color of the leather could be a bit blacker, but that's about it. The wheel is about 2cm smaller than the stock wheel, and much thicker which means it feels a lot more sporty. Anyway, yet still a couple of other mods to talk about, will be posting about those soon so stay tuned! Love it, Aki. Look's very OEM, not a MOMO and will be of great help out there, on the track. Seeing as my S13 Coupe will be the one hitting Sepang International Circuit, I've decided to opt for the BNR34 Steering Wheel route. If not for that, I would have most definitely considered going down the aftermarket path :). Let us know how it performs during track conditions! great blog about your BCNR33 that you have. It's nice to follow cars' life thanks for all the pictures. Here is my blog about my BNR34. Most of the pages are in french but there are a couple of english pages. Keep up posting new articles ! 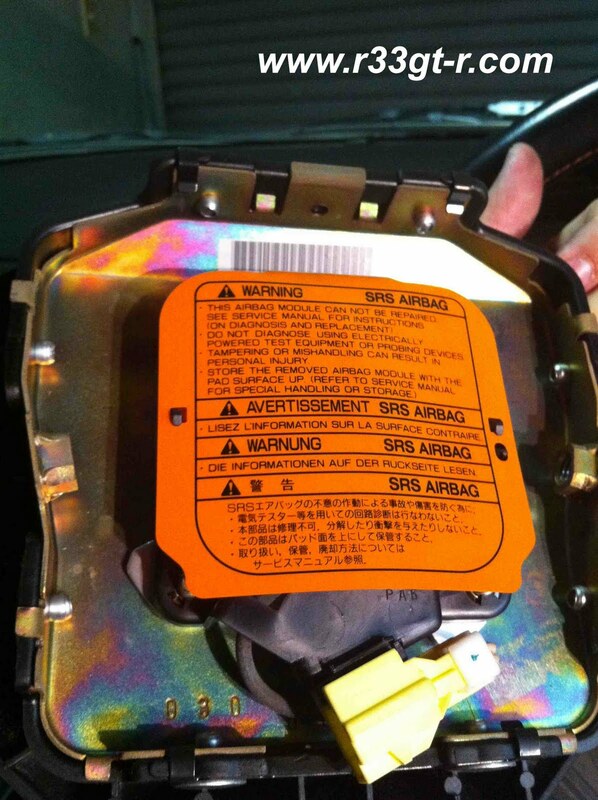 is your OEM steering wheel/Air bag for sale? I had an Ital Volanti on my RX-7 some time ago, which I changed for something else, but I always missed the feel of the Italian wheel. So I've bought another myself for the M3.. It's different to your's, but also nice. 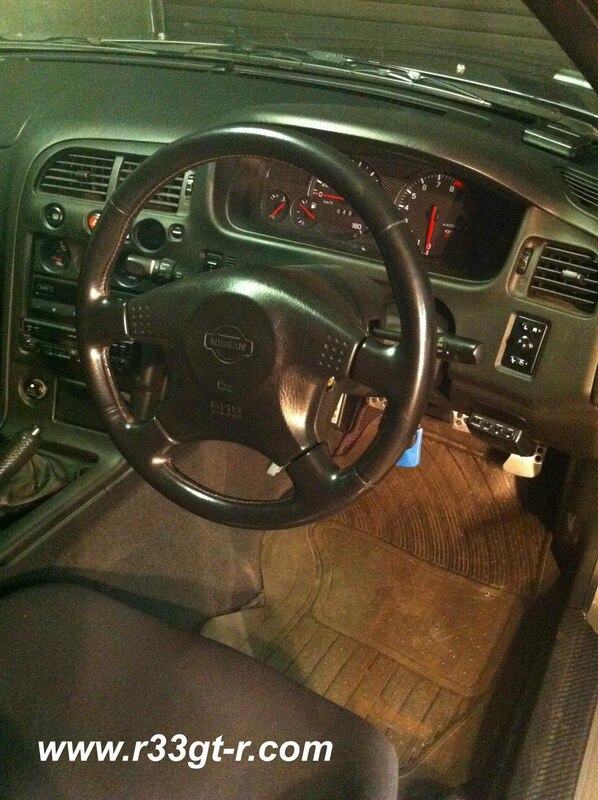 My Hiace has an Ital Volanti wheel too. They're my favourite, so that's a good mod you made there. Does your hicas still work ??? Yes, my HICAS is very healthy. Most of the time they all work just check the joints for any play due to worn out bushings etc.